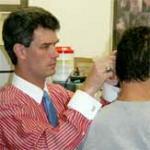 What surgeries can correct hearing loss? Audiology and Communication Services is proud to have been serving the Commack community since 1988. Since opening, we have assisted more than 10,000 people in improving their hearing and communication needs. With compassionate doctors providing personal and professional service to our patients, our goal is to make obtaining better hearing easy! We offer a comprehensive amount of services, which range from diagnostic screenings, hearing device fitting and adjustments to assistive listening devices for the entire home. Make an appointment with us today, we'll be happy to help you hear better! We have a location to serve you better in Commack. Dr. Peter Loring heads the Audiology and Communication Services office with a doctorate in audiology from the University of Florida. In his professional life, Peter has had the opportunity to garner experience in both private audiology and ENT practices and has an extensive background in providing hearing healthcare to children, adults, deaf individuals and the developmentally disabled. Peter also dedicates his time to his musical career, which has given him insight to helping musicians hear better and protect their hearing. All submissions are moderated. Reviews are typically published on clinic profiles within one to three business days.